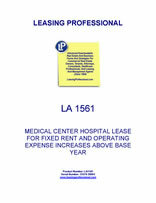 This Lease (“Lease”) is made as of _________________, by and between COMMERCIAL PROPERTY LANDLORD, INC., a __________________ corporation (“Landlord”), and AGREEABLE MEDICAL CENTER TENANT, LLC, a limited liability company (“Tenant”). (3) Tenant: AGREEABLE MEDICAL CENTER TENANT, L.L.C. (1) Fixed Minimum Rent: $____ per net rentable square foot annually, for the Terms hereof, payable $__________ per month for the full term of this lease. (2) Leased Premises: Those certain premises known as __________________, containing approximately _______ square feet of net rentable area, as herein defined and all fixtures and equipment as reflected on the attached "Exhibit D". The Leased Premises are substantially reflected on the attached Floor Plan and being located in the Building. (5) Term: The period beginning on the commencement date and continuing for 60 months with a series of options, in the Tenant, to renew the lease for three additional 60 month terms. (6) Rent: All Fixed Minimum Rent and Additional Rent. (7) Additional Rent: All rent and other sums payable hereunder from Tenant to Landlord, other than Fixed Minimum Rent. (8) Base Year: The Calendar Year _____. (iii) costs of all utilities, including but not limited to, the cost of water and power, heating, lighting, air conditioning and ventilating, telephone, cable TV, garbage removal, and said other utilities as are required for the operation of the Building. (ix) all other costs and expenses which would generally be regarded as operating and maintenance costs and expenses. (10) Escalations: The dollar amount by which the Operating Expenses exceed the actual Building Operating Expenses for the calendar year _____. (11) Pro Rata Share: 100 percent (100%), provided that if the Building is expanded or contracted, Tenant's Pro Rata Share shall increase or decrease, as the case may be, such that it will equal a fraction, the numerator of which is the net rentable area of the Leased Premises, and the denominator of which is the net rentable area of the Building, which is approximately _________. (12) Permitted Use: General Medical Hospital, provided such use is granted only to Tenant, and complies with all laws, ordinances and statutes. (13) Floor Plan: The outline of the Leased Premises as depicted in Exhibit "B" attached hereto and made a part hereof for all purposes. (14) Interior of the Leased Premises: Standard office front and entrance (including without limitation, all plate glass and exterior doors), all of the interior wall framing, floors and floor covering, ceiling and interior staining and finishes, all interior doors and hardware, all interior electrical conduits and appurtenances, mechanical machinery and equipment, all interior electrical fixtures, interior plumbing and plumbing fixtures, Tenants' trade fixtures, and all other parts in the interior of Lease Premises. (15) Building: The building in which the Leased Premises are situated, being generally known as ____________. (16) Common Area: Those parts of the Building and the Land and related facilities designated by landlord from time to time for the common use of all tenants. Including among other facilities, parking areas, sidewalks, landscaping, curbs, loading areas, private streets and alleys, automobile entrances, exits and driveways, entranceways, open (enclosed or otherwise), lighting facilities, drinking fountains, public toilets, signs, service areas, common utility lines, pipes, and/or conduits, and the like. (17) Land: The lot, tract or parcel of land upon which the Building is situated, in ________ County, ________ as more particularly described by metes and bounds on Exhibit "A" attached hereto and made a part hereof for all purposes, plus any contiguous parcels or strips of land which currently are owned by Landlord or leased to Landlord by lease agreement or easement, and are used in connection with or service the Building or any part thereof. (18) Security Deposit: The sum $________ to be deposited by Tenant with Landlord, and held by Landlord pursuant to the terms hereof. (19) Late Charge: $______ per each dollar overdue, per month. (20) Lease: This Hospital Lease Agreement. 2. GRANTING CLAUSE. In consideration of the Rent reserved and the covenants and agreements herein contained on the part of the Tenant to be observed and performed, Landlord hereby demises, lets and leases unto Tenant, and Tenant hereby rents from Landlord, the Leased Premises. are not paid by Tenant. (1) In addition to the Fixed Minimum Rent as specified herein, Tenant agrees to pay to Landlord as Additional Rent its Pro Rata Share of the Escalations. (2) Tenant's Pro Rata Share of Operating Expenses for the remainder of the calendar year after the Commencement Date and for each subsequent calendar year shall be estimated by Landlord, and written notice thereof shall be given to Tenant. Upon receipt of said written notice from Landlord, the estimated Escalations shall be due and payable as herein provided. For any such remainder of the calendar year after the Commencement Date, Tenant agrees to pay Landlord each month, at the same time the Monthly Minimum Rent Payment is due, an amount equal to the amount of such estimated monthly Pro Rata Share of Escalations for the remainder of such calendar year; and during each calendar year thereafter Tenant agrees to pay Landlord each month, at the same time the Monthly Minimum Rent Payments are due, an amount equal to one-twelfth (1/12th) of the estimated annual Pro Rata Share of Escalations due. If any portion of Operating Expenses increase during a calendar year, Landlord may revise the estimated Escalations during such year by giving Tenant written notice to that effect, and thereafter Tenant agrees to pay Landlord, in each of the remaining months of such year, an additional amount equal to the amount of such annual increase in the estimated Pro Rata Share of Escalations divided by the number of months remaining in such year. (4) After the end of each calendar year, Landlord shall prepare and deliver to Tenant a statement showing Tenant's Pro Rata Share of the total amount of Escalations. Within ten (10) days after receipt of the aforementioned statement, Tenant agrees to pay Landlord the remaining amount owed by Tenant. However, if Tenant has paid more than its Pro Rata Share of the actual Escalations, Landlord shall either pay to Tenant within a reasonable time the amount of such excess, or at Landlord's option, apply such excess to any sums due or to become due from Tenant to Landlord. (5) Notwithstanding anything herein to the contrary, in no event will the Fixed Minimum Rental provided for in this Lease ever be reduced. 3.3 Payment For Other Services. Tenant agrees to pay Landlord as Additional Rent all charges for any services, goods, or materials furnished at Tenant's request which are not required to be furnished by Landlord under this Lease, immediately upon demand, plus an administrative fee not to exceed fifteen percent (15%) of the cost of the requested services, good or materials. 3.4 Late Charge. If any Rent payment is not received by Landlord on or before the 10th day of the month, the Late Charge shall be due and payable (in addition thereto). Said Late Charge is for the purpose of reimbursing Landlord for the extra costs and expenses incurred in connection with the handling and processing of such late payment. 3.5 Abatement: Landlord agrees that tenant shall have the following months Fixed Minimum Rent abated: _________________. 4. SECURITY DEPOSIT. Landlord hereby acknowledges receipt from Tenant of the Security Deposit, which sum is to be held by Landlord as security for the full and faithful performance by Tenant of all the terms, covenants and conditions of this Lease to be kept and performed by Tenant during the Term hereof. If Tenant defaults with respect to any provision of this Lease, including but not limited to the provisions relating to the payment of Rent, Landlord may (but shall not be required to) use, apply or retain all or any part of the Security Deposit for the payment of any Rent or any other sum in default, or to compensate Landlord for any other loss or damage which Landlord may suffer by reason of Tenant's default. If any portion of said deposit is so used or applied Tenant shall, on demand, deposit cash with Landlord in an amount sufficient to restore the Security Deposit to its original amount, and Tenant's failure to do so shall be a default under the Lease. Landlord shall no be required to keep the Security Deposit separate from its general funds and may commingle said deposit with any other funds. Tenant shall not be entitled to interest on said deposit. It is expressly understood that the Security Deposit shall not be considered an advance payment of Rent or a measure of Landlord's damages in the event of default by Tenant. If Tenant shall fully and faithfully perform every provision of this Lease to be performed by it, the Security Deposit or any balance thereof shall be returned to Tenant (or, at Landlord's option, to the last approved assignee of Tenant's interest under this Lease) within thirty (30) days following the expiration of the Lease Term. In the event Landlord transfers its interest in the Leased Premises during the Lease Term, Landlord may assign the Security Deposit to the transferee and thereafter shall have no further liability for the return of such deposit.